Adhere to regular physical activity to improve gait and leg strength. Ask physicians or pharmacists to review their medications. 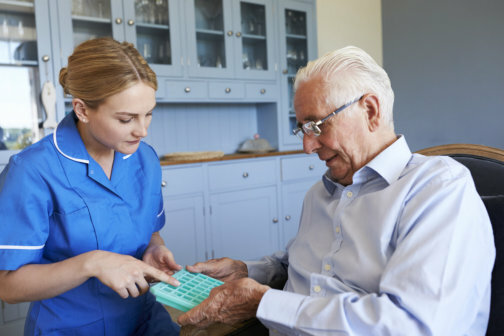 As an agency providing a wide array of home care services in Savannah Georgia, we find that medications are actually among the leading causes why seniors suffer from fall-related injuries. Furthermore, their regular doctors are often too busy to review the risks of aging adults falling as a result of their prescriptions. But if your loved ones are receiving reliable skilled nursing services, you need not to worry. When it comes to fall prevention in the elderly, medications are typically one of the most hassle-free risk factors to change. Once your loved ones’ clinicians have identified the medications that might increase their risks of falling, you need to coordinate with them in order to reduce or totally eliminate your family members’ usage of such medications. Often referred to as psychoactives, drugs that affect the brain tend to cause drowsiness or sedation in senior adults taking them. They may also cause or exacerbate confusion in individuals who are suffering from memory problems and are, therefore, availing of personal care in Georgia. These drugs should only be reviewed if your senior family members are dealing with diabetes. Low blood sugar, also known as hypoglycemia, is one of the many factors that are believed to cause falls in diabetic individuals. Concerned about falls in your elderly loved ones? Give Magnolia Home Care Service a call. This entry was posted in Fall Prevention and tagged eye check-ups, medications, prescriptions, regular physical activity. Bookmark the permalink.